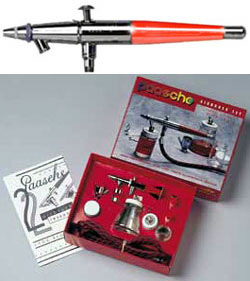 Paasche’s most popular double action airbrush set. It’s used in most every application for the airbrush. The set is supplied with all 3 spray heads, 3 and 1 ounce bottles, 1/4 ounce metal cup, 6’ hose, wrench, hanger, lessons book, and manual.